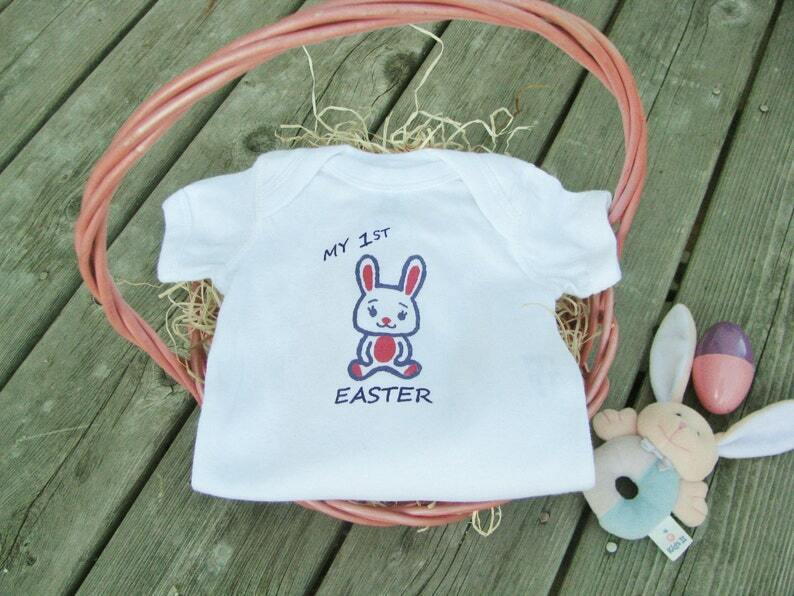 This, My First Easter onesie would make the cutest baby shower gift, or for your own Little Bunny for their first Easter. All our onesies are 100% cotton and are designed and hand screen printed by me. The ink used is non-toxic, water-based, permanent and does not fade when washed in the washing machine. Thank you for shopping As We Grow. No refunds on custom items. I accept returns and exchanges on unworn clothing still with tag only within 14 days of purchase. Buyer pays return shipping if correct item was sent. If a replacement is needed, Buyer will pay for the cost of the new item. If the wrong item was sent to the Buyer, seller pays for all shipping costs to send correct item. All items are sent USPS (United States Postal Service) unless otherwise agreed upon with the seller and buyer. If you require a special delivery method, additional charges will be created as an item that you will have to purchase. Any applicable customs fees or taxes will be the responsibility of the buyer. As We Grow ships First Class Mail unless otherwise noted. As We Grow does not guarantee delivery date. As We Grow is not responsible for items once they leave the shop. I try to make shipping costs as low as possible, however If you would like to purchase shipping insurance, please let me know before you order. My shipping charges are the cost of the Postal stamp, the cost of the envelop, the packaging and tagging. I do not make anything on my shipping charges. Tracking information is available once it has been shipped upon request. As We Grow is not responsible for items not delivered due to Post Office mishandling.